Editors Note: Flash back, Bruce Lee, the classic film, Enter the Dragon. Bruce Lee teaches the young student that while it is proper and respectful to bow to your teacher you should never bow too much. For if you bow too much you lose eye contact with the other person. You must always maintain proper eye contact with any person, certainly with a known opponent. As Tony points out below, feigning compliance is one thing, groveling and quivering before your opponent, even as a fake, is terrible. Both physically and mentally it puts you at a huge disadvantage. I always point out at my seminars to use body language to your advantage. I say do not look like a defeated coward, look like a champion, use the "Rocky position". Negotiate from a position of strength, that is your feigning compliance. If you study gangster behavior, as I have, you will see that even in "defeat" the true gangster (Italian, Jewish, classic era) will not show fear. As Tony points out they will always maintain excellent eye contact and they will speak with a sense of power, never acting defeated. No one pities the coward. 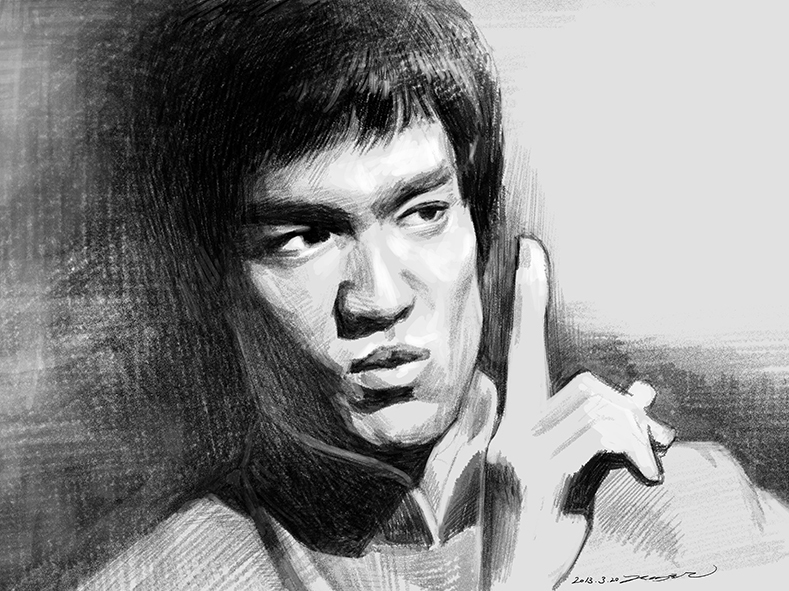 Bruce Lee; Always maintain eye contact and a position of strength. So I'm sitting here at the Tel Aviv airport in Israel. Just passing some time looking at a certain Krav Maga system and one of its recent seminars, (video on Facebook) first thing that worried me was the techniques seemed to be all about feigning subservience (no problem with that) what does worry me is that they take it to the extreme and lower the forehead and almost bow .... well in fact that's what's happening ... if the heads' down you're in for trouble... it used to be a fault of my own ... (yes I speak from various hospitalizations from being knocked out cold) if you lower your head and can't see the threat it's basically the end for you, dramatic as it sounds it really is over. A wise person will keep the eyes on the threat and keep as much situational awareness as possible. Let us not forget that this will be an extremely stressful situation so we must stay focused and not give away more control than we have to. Being held up with a knife or a gun is up there with worst case situations why make it worse with voluntary blindness. We sacrifice everything if we can't even see what's happening. Feigning subservience is not a bad thing but averting the eyes is!! This situation is going to be bad, it is only going to get worse if we loose one of our senses, in this instance the eyes, we are in a bad place because we need to be able to see our way to freedom not feel blind blows to our head. We need to know where our exit is or potential environmental resources such as walls, a coat hook or window. In fact we need to be amassing as much environmental data as possible in the second or two before we attack our attacker. A grovelling submissiveness is only complete by a complete aversion of the eyes and it will work in a pack of dogs but it's open season for the human A social predator. Do not lower your head to the point that you loose sight of the threat it's akin to burying ones head in the sand and hoping it will all go away. Krav Maga is not a game; it is reality. About the author: Tony has more than thirty years in the martial arts. He is a Krav Maga black belt and has been to Israel twice for Tour and Train.